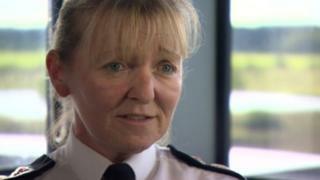 West Yorkshire Police's most senior officer has announced she is to retire "to face some new health challenges". Chief Constable Dee Collins, who has previously spoken out about her treatment for breast cancer, said she would step down at the end of April. The county's most senior officer said she had challenges she would "prefer to manage in private rather than as chief constable in full public view". Ms Collins said it had been "an honour to serve our communities". The chief constable, originally from Lymm in Cheshire, has served 31 years in policing, 12 of those as assistant chief constable of Derbyshire Constabulary and then as chief officer of the West Yorkshire force. She underwent surgery and radiotherapy after finding a lump in her left breast in 2009, but shared her story to try to encourage others to check themselves for lumps. Ms Collins is currently on secondment to the College of Policing, where she led the national Strategic Command Course. She said she was "leaving a very capable and talented team to continue to lead" West Yorkshire Police. Ms Collins said she had "very mixed emotions about retiring as I have loved my job, loved serving our communities and loved working with so many fantastic people". She said: "I have tried to encourage an understanding of the very human aspects of policing, with a culture that truly cares about our communities, given the very real challenges that all of the public sector are facing at the moment."